I often think of a day like a pie. I wish the pie could be bigger, but it's always the same size, 24 hours. Cutting down on the portion for "Sleep" never really works, so the other portions get re-arranged according to priorities at a given time. At the moment the "Work" portion of the pie is rather large, so kitchen time is unfortunately at a minimum. That doesn't mean that I can't eat food that has been cooked for some time for that comforting home-made taste though. It's the long, slow, cooking with minimal kitchen time approach. The weapons needed for this approach are either an oven or electric range, or a slow cooker / crock pot. I wouldn't do this on a gas range unless you can be home for the time your pot of whatever is cooking, just in case something happens. A slow cooker is a great addition to any kitchen, if you have a busy life - and who doesn't? The cooler months are perfect for this type of food. Some long slow-cook/short kitchen time dishes do need some preparation. Stews for instance - just throwing everything uncooked in the pot can result in an insipid mess. You need to brown the meat, sweat the onions, etc. Boston baked beans, on the other hand, need no preparation at all. If you have all the ingredients on hand, the kitchen time is maybe 10 minutes total, including the time needed to check the pot and stir. You don't even need to pre-soak the beans. The cooking time is not really fixed either - it can be 8 hours, or 12 hours, or even more. The longer it's cooked, the deeper the flavors become. The beans get softer and mushier of course, but mushy beans really taste great. (You may need to add some more water to avoid it turning into one lump, if you leave it cooking very long.) You could start this in your slow cooker or oven early in the morning, and come back to a house smelling like dinner. The traditional Boston accompaniment for baked beans is Boston brown bread, but I just like to have it with some plain rice or other grains like spelt (which is what is used in the photo). Rice and beans - the universal complete protein combo. They can be served the British way, over toast, too. I have given vegetarian (even vegan) and omnivore versions. Both are very good. If you have only ever had beans out of a can, you have got to give this a try at least once. Equipment needed: an oven and a large, heavy-bottomed pot, or a crock pot or slow cooker. Slice the onion. Smash and roughly chop the garlic. Peel and grate the ginger. Put all the ingredients into the pot. Pour in water to about 1 1/2 inch / 4 cm above the level of the beans. Mix well. Serve with carb of your choice. The perfect accompaniment is a crisp, green salad of romaine or cos lettice, with a sharp vinegarette. The bacon or chipotle give the beans a slightly smoky flavor, so you can use both, or just one. I would just fish out the bacon afterwards since it would have given all of its soul to the beans, though you can eat it if you want, of course. The chipotle will probably just disintegrate, but if you are left with any inedible skins just take them out before serving. You may regard the addition of ketchup as blasphemy, but it does add a bit of sour-sweetness plus color. Omit it if it goes against your religion. To make this appeal more to unrelenting carnivores, add some whole wiener-type sausages during the last 15 minutes or so of cooking. Submitted by maki on 2006-10-17 18:18. This sounds wonderful... however, I have one quick question. You wrote that you slice the onion, but wouldn't that leave large rings? Did you mean 'dice' the onion? Chris, since the beans are cooked for so long, you can just slice the onion and it will disintegrate. You can chop it up if you want of course. So I was very excited to make this recipe -- it looked great and I love baked beans. Unfortunately it didn't turn out quite like I was hoping -- way too spicy. However, rereading the recipe I realized I had misunderstood part of it. On the ham/chipolte line, I read it as 3oz of Chipoltes (or 4 dried). Since I had just used up all my ground chipolte and the grocery store was out of dried, I went with canned and added 3oz. The result was quite spicy, which is unfortunate as I like my baked beans sweet. I also must have added way to much water. (was hard to see the level of the beans, since the spices and stuff clouded the water. I'll add the water first nextime) However, that was easily fixed by added a some cornstarch slurry at the end to thicken the sauce. Ceylonna, it does sound like you added a bit too much of the chipotle. Next time maybe add just one, or omit it altogether, and/or omit the cayenne also. I do like a spicy undertone to cut the sweetness of baked beans but I know a lot of people do like it to be sweeter. A recipe is just a starting point for your own variations. For what to do with all the beans...maybe try turning them into a bean soup? Mash up the beans with a masher or with an immersioin blender, or in a blender or food processor, and add soup stock (water + boullion cubes) until it's the consistency you like. Add a bit more seasonings if it's needed, and even a bit more molasses if you want it sweeter (taste a lot!) and serve with a dollop of sour cream or creme fraiche or thick yogurt. It's sort of a variation of black bean soup. The spiciness in this case should turn out nicely. I have just tossed together your recipe for these beans and have been in the oven for 2 hours. I don't know how I am going to survive for another 5, the aromas are so amazing! I have a loaf on no knead bread waiting to be cooked once the beans are out and a large Creemore Springs beer (Canadian) waiting in the wings. I will be sure to let you know how much I enjoyed dinner! YUM. These were sooooo yummy. I'll be making them again and again. Thanks. My grandmother uses the leftover pickling juice from sweet or savory pickles in her beans (in addition to many of the other ingredients you mention). Nothing wasted, and it tastes fantastic. I am perplexed. Several times when I have cooked these beans @ 325 degrees for 7 hrs., the beans actually got harder not softer. In fact they were inedible. I brought the beans do a boil and then soaked them over night. I love these beans, but what is happening. Are you using hard water? Are you using hard water? Beans bake better with soft water. Hey Maki, I found your site around 6 months ago when looking for easy, awesome Japanese recipes. We've made onigiri, soba, and the potatoes with soy sauce and butter. But strangely enough, one of our favorite recipes of yours is this one! Yay, cheap easy food that is delicious and healthy! Thanks so much for your awesome blog. I made these beans last weekend as part of a BBQ we put on for friends. Everyone raved about the beans... and I had the leftovers for dinner last night and could hardly believe I'd made them they were so delicious. I love how easy they were to make and how healthy the ingredients are. Thanks for the great recipe and great site. Sounds like a great recipe and I'd love to try it. However I've got 20lbs of dried pintos thanks to my dear cost saving husband. Would there be any consequences to using those? * Use a real, old fashioned beanpot. It gets seasoned with age and the beans always come out the right consistency. * Set the oven at 275 for at least 6 hours. * Not only do you pre soak the beans (best to do the night before cooking them), you then boil them until they start to burst BEFORE putting them in the beanpot with everything else. This ensures soft, flavor-full beans. * I use: molasses, brown sugar (light or dark, whatever is in the house), dried mustard, salt. I slice up salt pork and brown it in a frying pan, before layering in the beans. I slice up an onion into quarters to layer in the pot. No need to dice. * Layer your ingredients. I combine brown sugar with the mustard (again, just eyeball it, but it's probably 5-6 t of brown sugar, 1 T of salt and 1-2 T of mustard) with the salt. I then do these layers: sliced onion, salt pork slice, beans, brown sugar mixture, pour some molasses over that, repeat layer, etc. After everything is in the beanpot I pour boiling water over the mixture to cover. Set in the oven and start cooking! * Check the beans after a couple of hours and add water if necessary. By the end of the 6 + hours, the water has turned into a luscious syrup/sauce. * As one poster said, it's really great and easy to put the beans into the oven before going to bed. When you wake up , they are done. This is particularly useful if you are serving them for a holiday (they make a great side dish for Thanksgiving and Christmas) -- it's then one dish out of the way. Hi, I'd like to try this recipe, but I have one question about the beans. Do you put them in dry? I have a lb of beans on hand that I've already soaked over night. Is it okay to use those? Hi Sharon, in this recipe the beans are cooked from dry/unsoaked, but you can use your presoaked beans and reduce the cooking time by an hour or so. I just got done cooking these. Do yourself a favor and buy fresh dried beans. Mine were old, and I had to cook this for about 20 hours in a slow cooker until the beans were finally tender. This will be my staple Boston baked bean recipe, the flavor is deep. I used sliced, uncooked bacon cut into pieces, and also chipotles. Very rich color, very pleased. I made these for the second time today. Gorgeous! As I'm sharing it with a little one I use half the amount of sugar and half the salt suggested (I also substitute the pork for half a teaspoon of smoked paprika and use just one deseeded dried chipotle, oh yes, I also use half a small can of Spanish tomate frito, Hida brand, which is slightly more toddler friendly than ketchup). Today I was just short of the required amount of haricot beans so I added some unsoaked black turtle beans (roughly 15% of the total). Came out a treat. I have been cooking these beans for over 40 years and were always a special feature of our braais ( barbecue). A brother of a friend once wrote to me from the army asking if he could have some next Sunday on his way through. His sister looked quizzical. When asked she said it is the only time she can remember him writing anything. At boarding school his parents had to phone to find out if he was alright! I have always used a Robert Carrier recipe with quite a bit of tomato which was nice I was wondering if it should have tomato and next time I will cook it 'proper like'. The special instruction he gave was to raise the lump of pork - not necessarily pickled or smoked near the end and remove the lid and allow it to brown. I also have added a little brandy as well to sharpen up the taste. This time I am going for a very strong pork taste. I have had the butcher pickle a piece of belly of pork and I am going to roast it in the oven until crisp then cut off the crackling and add the pieces in slices and the crackling I will place on the top after cooking is completed. On beans in general I always cook up beans and add to all sorts of things - cottage pie for example. It gives greater bulk and their mild taste does not throw the flavour. The water is an excellent base for soup. Beans are something we are supposed to eat every day. Sometimes I just take a few cooked beans and flash fry with light soy, fish sauce and lemon then add green beans as well, or just in Italian tomato sauce. So OK my recipe is not 'original' but it should taste good. B-b-but, I thought you had to soak beans and boil them HARD for at least 10 minutes to kill any toxins - I read that cooking them in the slow cooker without pre-boiling actually makes the toxins more toxic as the casserole doesn't boil, just simmers. I do make lovely bean casseroles - not Boston baked beans, but just bean casserole - in my slow-cooker and love it, but would always pre-soak and pre-boil the beans, just to be on the safe side. I have never heard of dried beans having 'toxins'. I know that they do contain a substance that makes you gassy, and to reduce that effect it's recommended to bring the beans to a boil once then dump that initial boiling water. But it won't kill you to fart a bit either, and I've eaten these baked beans dozens of times without any ill effects. It actually depends on what kind of bean you use. Red kidney beans do contain a toxin called haemagglutinin; however this is reduced to non-toxic levels through soaking and boiling for a short while at a high temperature. This recipe uses white cannellini beans, which contain far lower levels of haemagglutinin than red kidney beans. I was just thinking about the toxin issue too so I'm glad Annabel mentioned it. Just last week I read about the issue and it's quite true about the toxins, and quite unpleasant but it's not lethal. I "re-googled" cannellini beans and re-read the Wikipedia article (hope it's accurate). Soaking, even re-soaking, then discarding water reduces flatulence but ten minutes of boiling beans de-grades the toxin (highest levels are found in red kidney beans). Your Food and Drug Administration advises this (I'm from South Australia). Interesting that the poisoning is supposed to be most commonly associated with slow cookers because boiling never occurs and the toxin becomes far more toxic! But I'll still make this recipe, it sounds unreal, not the type of meal we have here too often. Can't wait. I'll just reduce cooking time like you suggest. Great recipe and friendly, helpful comments. Thanks. I learned that one remedy for beans and flatulence is to add about a 1/4 cup of cider vinegar to your soaking water and beans. This is supposed to reduce the chemical in beans that causes flatulence. Then rinse the beans before boiling. Since adopting this method I have found improved digestion. Not a large, scientific survey but works for this one subject. I have never heard of toxins with the beans. But I raise my own so I know what is and isn't applied to them and I am organic. I have never ever had a problem with anything,but this is good information to know. I will look into it further. Also how much ginger should be added.... I mean a chunk to me could be a lot bigger than what you think it should be! LOL!! Thanks! I look forward to making this!! where is your print button located,i want to print this and i don't see a print button on this recipe and i really like baked beans and this one sounds good. Click the 'printer-friendly version' link right under the article, then use your browser's Print function. As long as you don't undercook red kidney beans (or lima beans, which have a different toxin), you should be fine. It has nothing to do with pesticides. After all, an organic castor bean still has ricin. Hmmm, I think this time I put too much water in mine. Took the top off, so it'll thicken up a bit. It's been great in the past. My Grandmother and aunts and mom have been cooking beans for many years and I'm 45 years old and they have NEVER soaked their beans before cooking them, I turned out find never got sick or anything from eating them. Just saying.. I have been making Baked Beans for more that 60 years, and this recipe is not Boston Baked Beans. Hot peppers? You have got to be kidding. 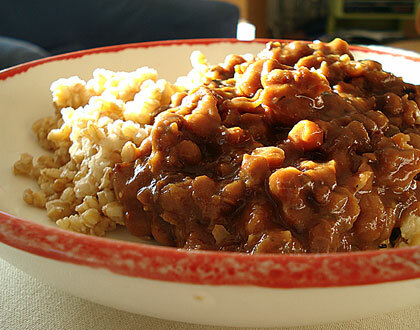 Boston Baked Beans are navy beans, brown sugar, molasses, dry mustard, and salt pork. You do soak your beans overnight. Don't have to, but it makes for a more tastier bean. Using a well seasoned bean pot is the way to go. Mine is more than 40 years old and doing fine. I tried to make the beans in the slow cooker. Forget it. Tasted terrible. You can certainly make them in the slow cooker but count on letting them cook 16 hours . Mine are wonderful . No ketchup tho I agree that's not proper for Boston Baked beans ? When cooking any dried legume I always add 1 tsp of baking soda to the first water,bring to a boil and let sit for an hour. I have never had hard beans or an overabundance of flatulance. Can't wait to try this recipe although I will cut it in half since there is only me.